The WC-8 uses Western Instruments’ WC-Series Platform, which is similar to the W-Series platform, but far more compact. 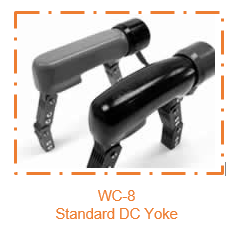 WC-8 yokes have urethane rubber housing that provides superior durability in rugged environments. Each WC-series yoke is equipped a standard low-profile sealed membrane activation switch, providing the operator proper safety as the switch is a grounding provision and conducts less than 1/2 watt of power. 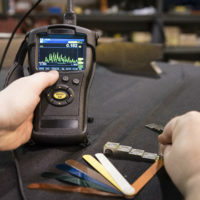 All W-Series and WC-Series yokes have more height between the operator’s hand and the work piece, which means faster inspections due to a larger view of the target area. All these advancements permit the 12 Volt Pulsed DC Yokes to have a 100% duty cycle! 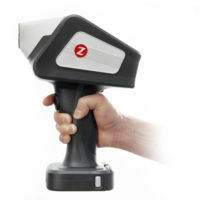 The ergonomically designed grip, combined with WC-Series light weight reduces operator fatigue and strain, which permits longer and more thorough inspections. The compact design allows the WC-8 to fit into tight spaces better than our full-size W-Series models. 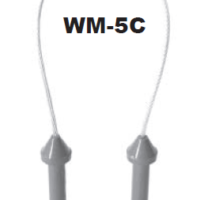 Combined with our Universal Articulating Pole Pieces, the WC-8 can be fit to almost any configuration of work piece. Like all W-Series products, the Power Cord Strain Relief system is the most durable in the industry, but on the WC-8 the Strain Relief can be directed up or down, permitting even better access to confined spaces, or simply just for operator preference.